This and all photos courtesy of and Copyright by Lynn Karlin. All rights reserved. 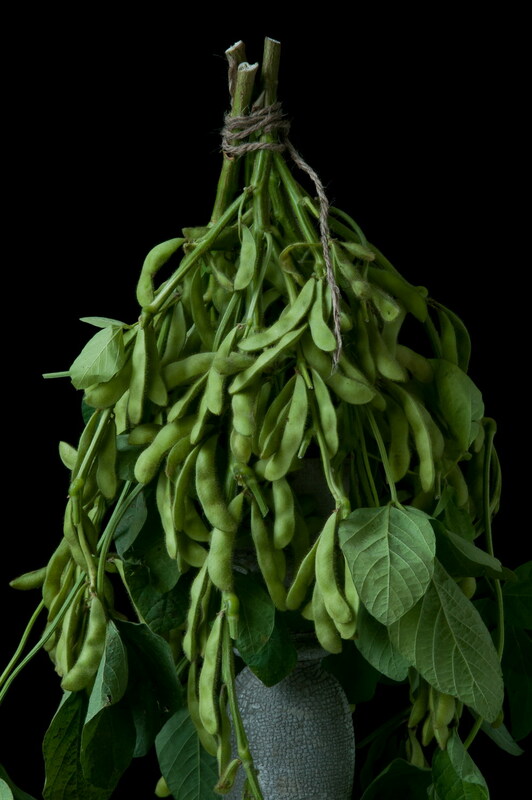 Editor-at-Large Therese Ciesinski has a chat with prolific photographer Lynn Karlin, whose work has appeared everywhere from The New York Times Magazine to House Beautiful, about her striking farm-to-studio veggie shots. Q. 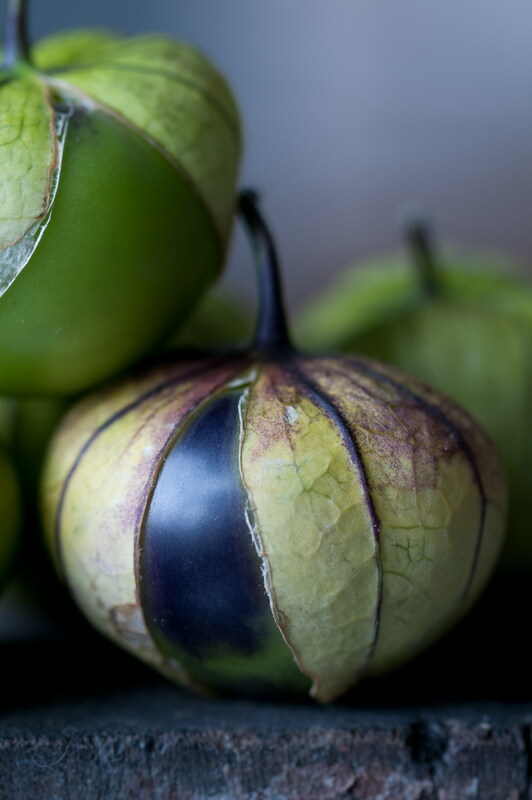 What compelled you to photograph vegetables? A. 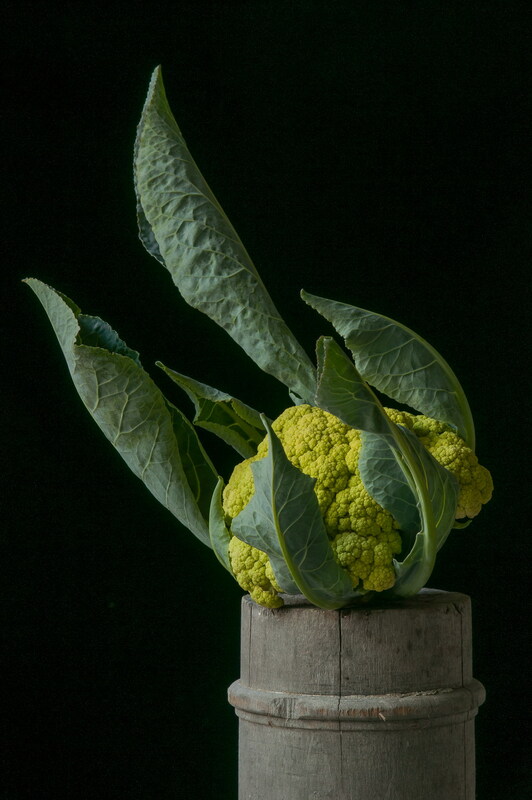 People don’t really look at or see beauty in vegetables. 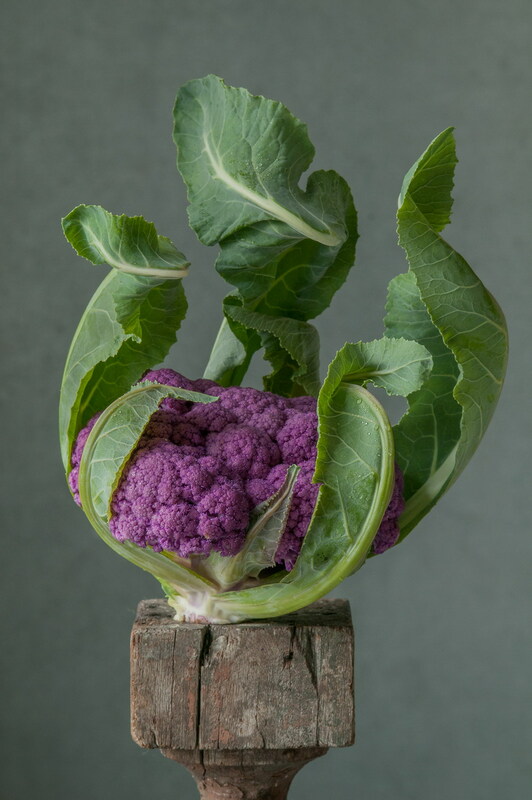 I became entranced by a purple cauliflower I bought at the farmer’s market. 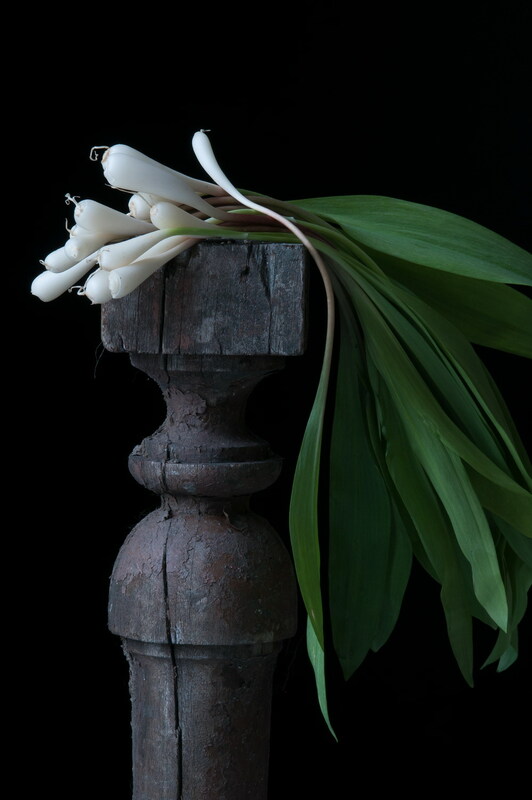 I brought it home, put it on a white pedestal by an east-facing window, and photographed it. A. Since 2008. I use local produce that I buy at the farmer’s market. When I’m looking for vegetables, I’m like a kid in a candy store. It’s like looking for a treasure at an antique store or flea market—what will I find today? I shoot the vegetables as soon as I get back to the studio. They are as I found them. Nothing is photoshopped. Q. What do you look for in a vegetable subject? A. Well, it has to fit on the pedestal! It doesn’t have to be beautiful, but must have interesting form, texture and structure. I do tend to lean towards the more beautiful and sensuous examples, though. And I look for the vegetable’s best side. Farmers are now cleaning their vegetables up too much for market. I look for ones that still have their leaves, stems, or roots. I want them in their entirety, intact. Q. Which vegetables are the most difficult to shoot? A. Anything round, especially the large tomatoes. It took a long time trying to get them to balance but once they did, they stayed there for 12 hours. Q. How do you keep them from falling off the pedestal? A. I try to get them to balance on their own, without outside support. If nothing’s working, I’ll use a nail as a last resort. I spend a lot of time getting them to balance. Some, like the adamame (soybeans) on the branch, I just plopped down and they stayed the first time. Q. 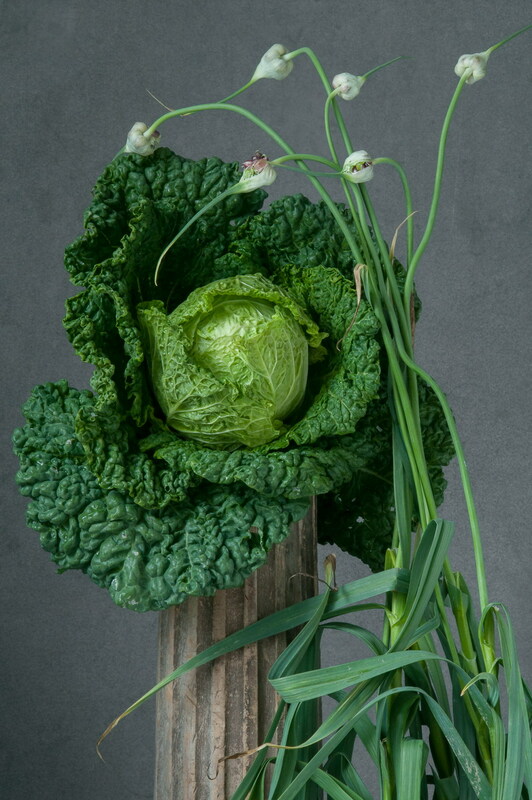 How many vegetable portraits have you shot? A. Close to one hundred. Q. Which is your favorite vegetable subject? 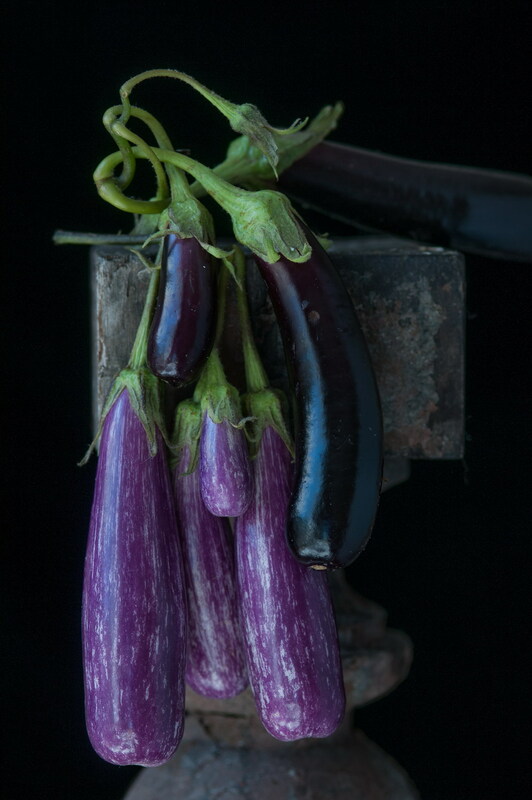 A. Eggplants: there are Italian and Oriental, in white, purple and deep, rich rose. They have such varied shapes and sizes. And cauliflowers—I’ve shot dozens, I can’t resist. They come in so many colors. I love the way the leaves wrap around the head. They’re an amazing natural wonder. I’m amazed every time I see them. I always see something new. Q. What are you striving for in these photographs? A. To bring out the personality of each one—representative of what they should look like. To show their natural beauty and bring out personalities. 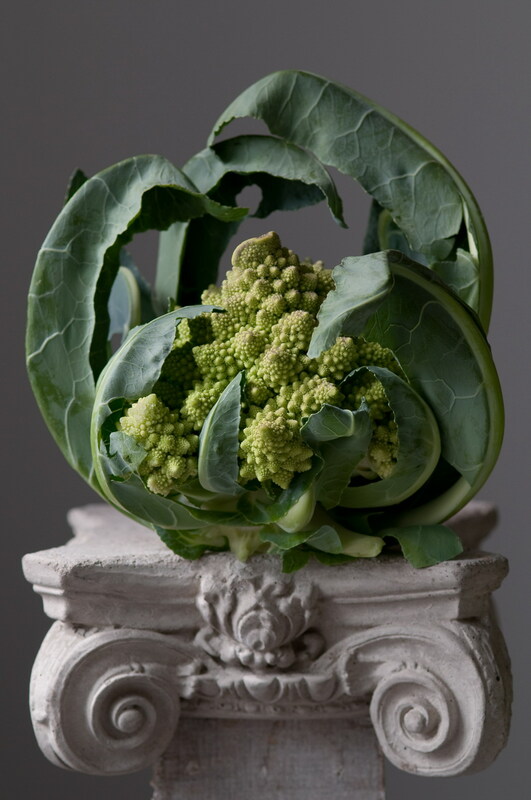 I was always drawn to good design, and I’m drawn to the beautiful design of vegetables. I want to honor vegetables by literally placing them on a higher level. Q. 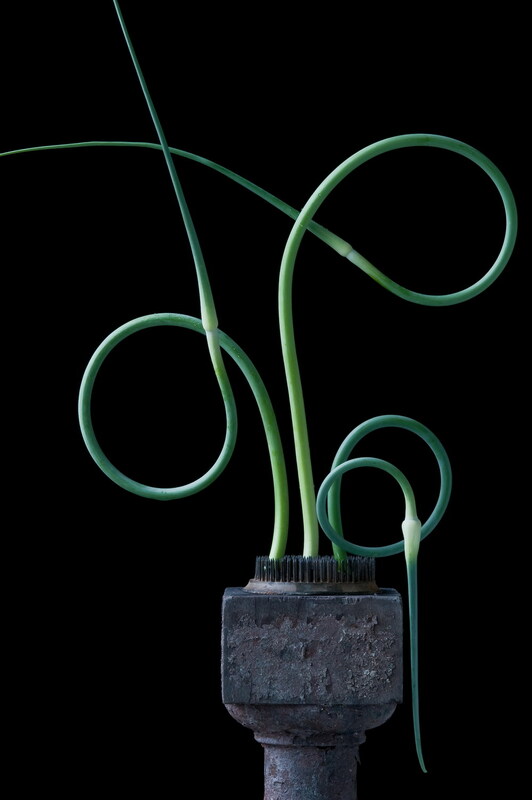 Has your vegetable photography won awards? A. 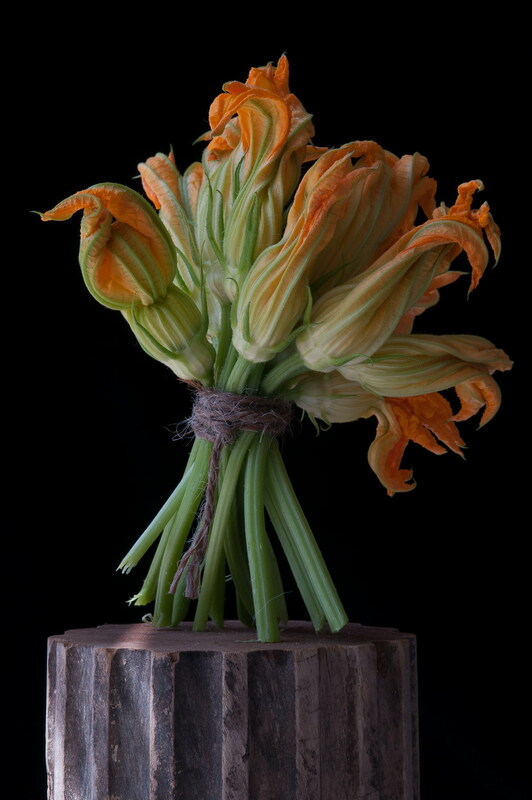 The photo of squash blossoms shot for the regional publication The Hook won a Garden Writers Association Silver Media Award in 2011. People really respond to that photo. I think it’s because it’s the most flowerlike. The squash blossoms came as the bunch that you see, and stood up right away. 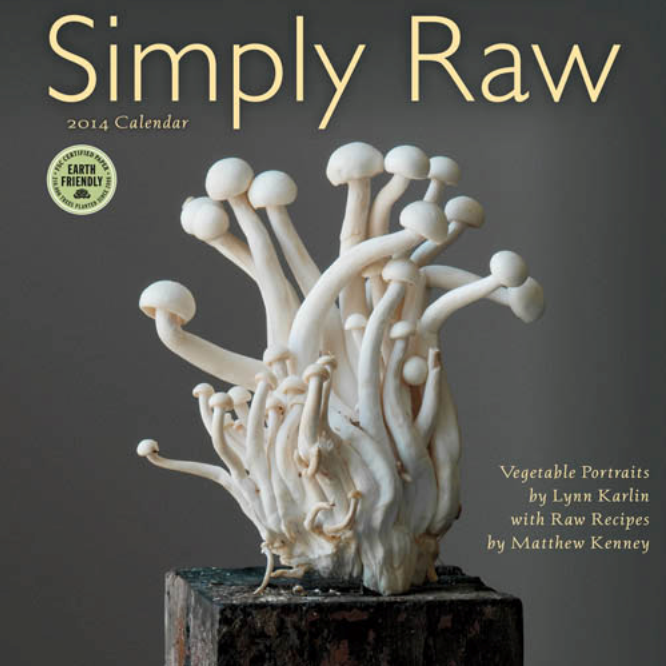 Another award-winner from the Harvest Series is the 2014 Simply Raw calendar, which won a 2013 GWA silver award of achievement in photography. Q. Where do you see yourself going with this? A. I’m still passionate about it—I’m looking forward to the farmer’s market in the spring. It’s fun to look and find and style the vegetables. 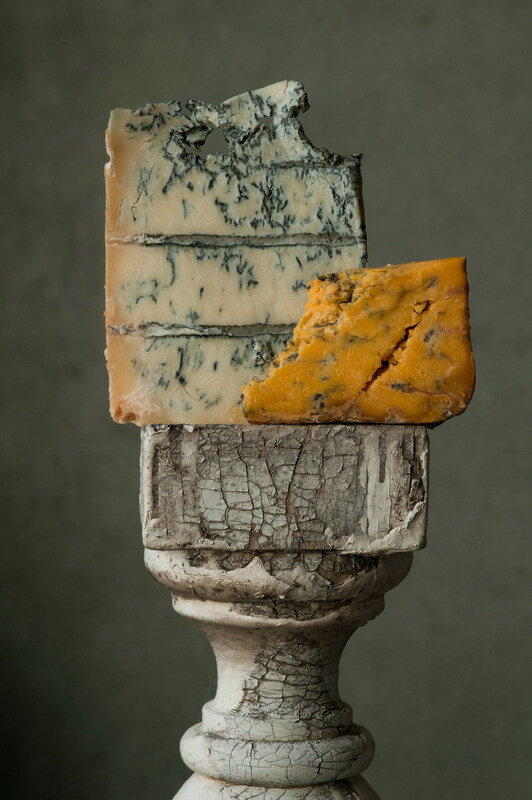 And I’ve done two more pedestal series: one on mushrooms and another on cheeses. These series are moving me towards doing more food photography. Lynn Karlin’s fine art photographs are limited edition prints, signed and numbered, in three sizes, framed or unframed (starting in four-figure price range). For more information on the prints, or to purchase Harvest Series notecards with envelopes, e-mail info@lynnkarlinphoto.com. Her photo-rich “Simply Raw 2014” calendar is available for only $14.99 at Amber Lotus. This entry was posted in Art, Photography, Uncategorized, Vegetables and tagged Lynn Karlin, photographs, photography, photos, vegetable images, vegetable photographs, vegetable photos, vegetables. Bookmark the permalink. Nature is the template for all art! Working with Lynn Karlin on the Simply Raw calendar has been pure bliss. Her professionalism is outstanding. 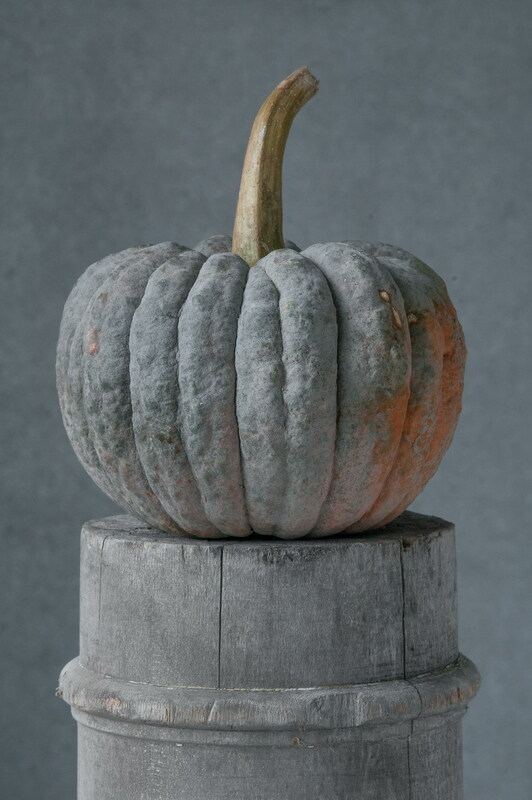 The pedestal series is such a delight to work with as well as her more traditional garden photography. We are so blessed to have her as a artist contributor for Amber Lotus Publishing. What lovely images! A pleasure to behold on a rainy, cold day in Maine. Thanks Lynn and happy new year!